Rize Governor Kemal Çeber and the District Governor of Pazar, Ayhan Terzi, visited Çayeli Bakır, one of Turkey’s exemplary mining operations. 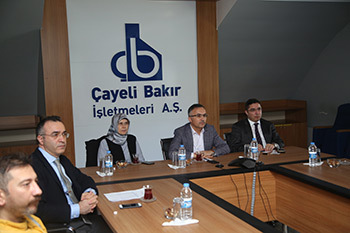 Governor Çeber, who made the visit accompanied by his wife and children, thanked Çayeli Bakır for its sensitivity to the environment and the social responsibility work undertaken by the company. Rize Governor Kemal Çeber and Pazar District Governor Ayhan Terzi visited Çayeli Bakır, one of Turkey’s exemplary mining operations. 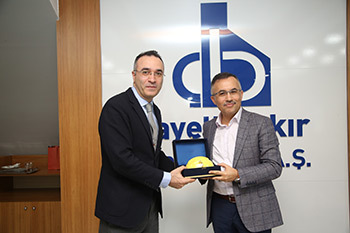 In the first part of the visit Çayeli Bakır General Manager Murat Güreşçi made a presentation about the mining operations of Çayeli Bakır and the work that was being done on occupational safety in the mines. Governor Çeber, who made the visit with his wife and children, went down into the mines after the presentation to see the mining operation firsthand and meet Çayeli employees. Expressing his pleasure in having this visit, Murat Güreşçi also emphasized Çayeli Bakır’s sensitivity to the environment and how all the work is carried out with a constant awareness for social responsibility. He promised that Çayeli Bakır will continue to do its part concerning the environment and social responsibility as always and keep adding to the value of Rize. Rize Governor Kemal Çeber, who thanked General Manager Murat Güreşçi for Çayeli’s special attention to occupational safety, added “I was very pleased to observe, while I was being provided information and was able to go down into the mines, that occupational safety and worker health is very important to Çayeli Bakır. Working conditions for occupational safety have been achieved at world standards in the mining area”. Governor Çeber also thanked all the authorities for Çayeli Bakır’s social responsibility projects throughout Rize and the company’s sensitivity to the environment.